I could do Buffy. Blonde wig, leather jacket or trousers, animal print, cross on a necklace and a wooden stake. 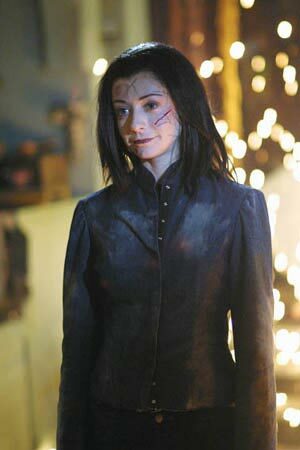 Willow from Buffy, she is a nerdy witch. Here she has turned evil. For her I would need dark hair, black contacts, a dark dress and draw the veins in eyeliner faintly than put white powder on top. 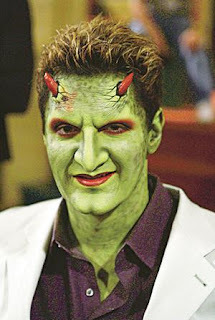 Lorne, is from Angel a spin off of Buffy. He is also know as The Host and was born as Krevlornswath of the Deathwok Clan. He is a friendly demon who by singing can tell you about your live. He wears brightly coloured suits. This prosthetic mask is also from Awen Creations, plus put on green make-up seperetly.